Rushing at the last minute while driving – is it worthwhile? We've all done it – we're driving somewhere, and as we get closer to our destination, we're watching the clock, gritting our teeth, and clenching the steering wheel because we know we're going to be late. So, we stuff our foot down and try to make up for lost time. I know I've done this many times, and recently while doing this, I began to do some mental math and I questioned whether or not it really made a difference. Nevertheless, I kept my foot glued to the floor, cut off 3 people, narrowly missed a school bus full of Nuns and orphans, and screeched into my parking spot … late anyway. Later, I decided to do some number crunching and see if my off-the-cuff mental calculations were correct. I decided to use a 100 mile trip as a model (mainly because it's a reasonably long trip, and also makes the math nice and neat). My assumption was that cruise speed will be 65mph, and when the driver decides to go into "rush" mode at the end of the trip, it'll zip up to 80mph. Of course, with traffic, those aren't necessarily realistic numbers that you could sustain for any length of time, but we'll use those as a best-case. This means that any time saving we calculate will be less in reality, but we should get a good "feel" for how this plays out. The graph below shows what happens when you go into "rush" mode. The blue part of the bars is the cruise mode part of the trip (so the first one is all cruise, no rush), and the red part is kicking into high gear. In each successive trip, I started the rush 10 miles earlier, until the last trip is all rush. The number to the left of the bars is the trip time in minutes. As you can see, the trip would normally take 92.6 minutes. By rushing the last 10 miles (which was the trigger behind all this), only 1.7 minutes are saved! Here's another way to look at it. 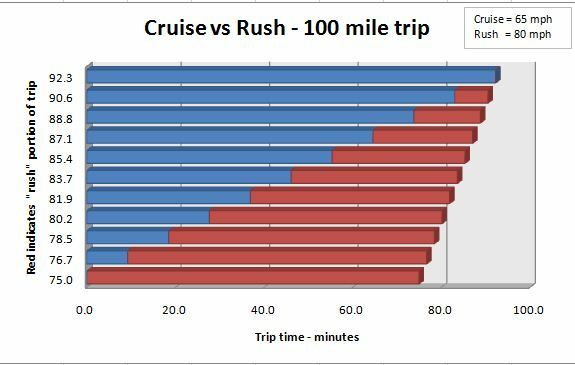 As you can see from this second graph, if you rush 10% of the trip, you save around 2% on the trip time. 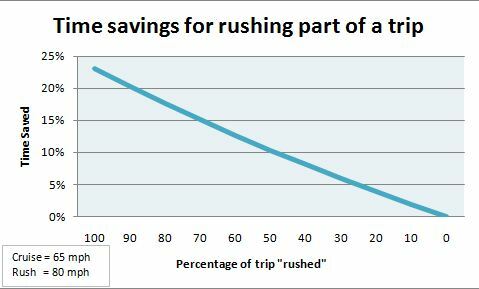 If you rush 20% of the trip, you save a whopping 4% on the time. Even if you rush for ALL of the trip, it only gains you something like 23% time savings. What does this all mean you ask? What's the bottom line? Well, based on the information above, it's clear that rushing the last part of a trip really doesn't buy you much. In fact, one could argue that for short trips, rushing the bulk of the trip would only save you 25% on time, so for a 20 minute "around-town" trip, you'd be saving a whole 5 minutes. It just doesn't seem worth the hassle, extra gas burned, extra risk of incident, and nervous engergy required to shove your way through traffic in a vain attempt to maintain that "rush" speed. So, next time you are late for an appointment, don't stuff your foot down, just accept the fact that you should have left earlier, and that there is nothing you can do at this point, and continue on. Oh, and thank me for saving you gas, blood pressure, and tires. And send me a check. Yea, that's the ticket.